This pattern is part of The Confluence Collection. 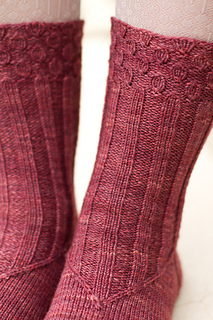 These socks rock a textured cuff, with classic ribbing to keep them snug around your ankles. 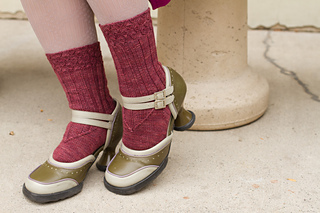 The instep detail will give you a little smile every time you look down. 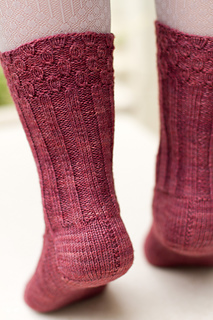 These socks are worked in the round from the cuff down with a clustered stitch motif at the upper cuff that flows into ribbing, the ribbing in turn flowing into a tapered peak on the instep. The heel flap is work flat, with a faux seam stitch down the center heel, and the foot is worked in stockinette after the tapered ribbing instep. Needles: Set of 5 double points in 2.25mm (US 1) or size needed to obtain gauge. foot circumference (see notes), 7 inches (17.75cm) from cuff edge to top of heel flap. Notions: Tapestry needle to graft and weave in ends, cable needle. Foot size should be measured as circumference around the foot just above the ball of the foot. Some ease is built into the pattern, so that the 7-inch circumference sock will fit a 7.5 inch foot and so on. The cast-on should be worked with a long-tail method over two needles held together, and then one needle should be removed. This will create a very stretchy edge for the cuff ribbing. A tutorial for this can be found at http://youtu.be/IhQaIckH5H0. Yardage estimates are given for a women’s size 9 foot. Yardage will vary for a larger or smaller sized foot. All charts are worked in the round and all chart rows should be read right to left. Stitches Used: knit, purl, k2tog, ssk, knit front back and front, sl 1 k2tog psso, Right Twist, Left Twist, 3-st Twist, slipping with yarn in front and back.